A highly effective insecticide containing the proven insect growth regulator (IGR) active ingredient diflubenzuron. JustiFLY® Feedthrough is EPA-approved for use in all pasture and confinement cattle and calves (including veal calves) for the control of horn flies, face flies, house flies and stable flies. 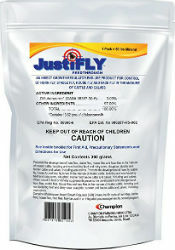 The add pack is a pre-measured dose of JustiFLY® Feedthrough larvicide, producers simply mix in their preferred 50 lb. bag of mineral and feed according to labeled rates (see label for complete feeding directions). No animal handling stress, keeps fly control simple and economical. With a mineral/JustiFLY® Feedthrough consumption rate of 3-4 ounces/head/day, one package of JustiFLY® Feedthrough treats approximately 200 cow days (1,200 lbs. each). 12 lb. bag supplies 15 cows for 200 days. Broad-spectrum fly control for just pennies a head/day.